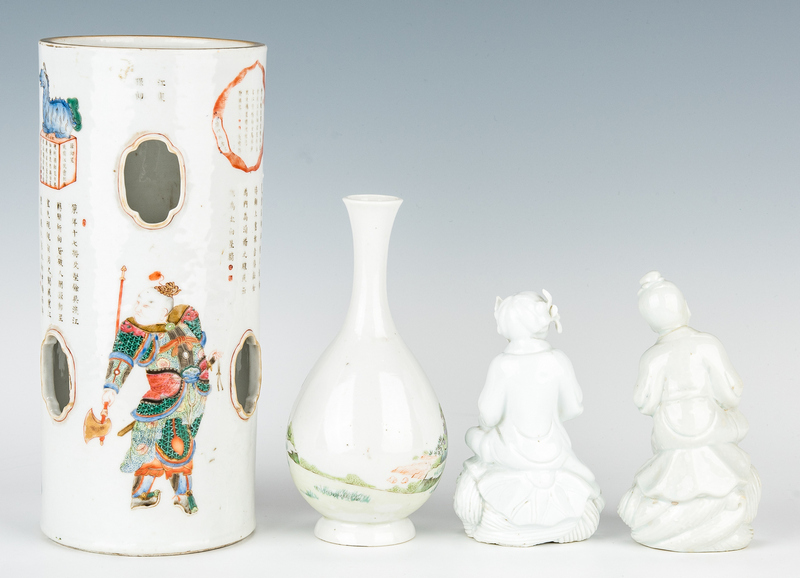 Chinese Hat Stand, Vase and Blanc de Chine Figures, 4 items total. 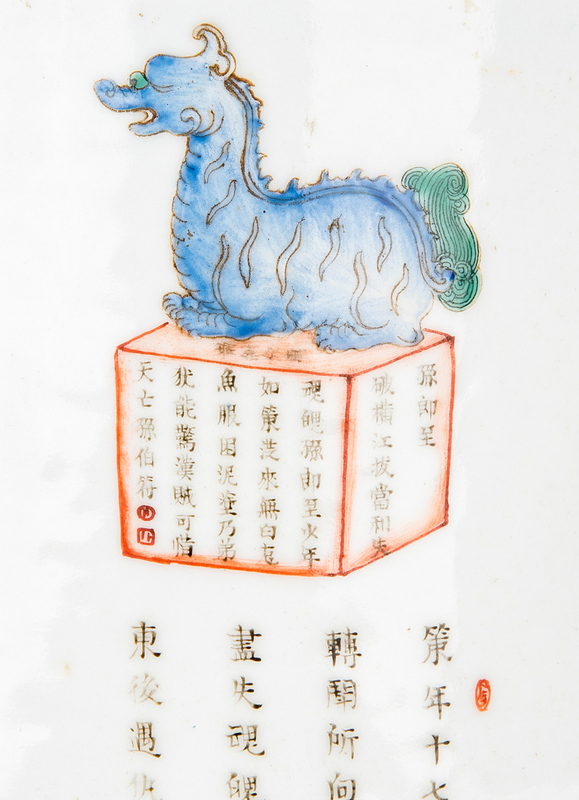 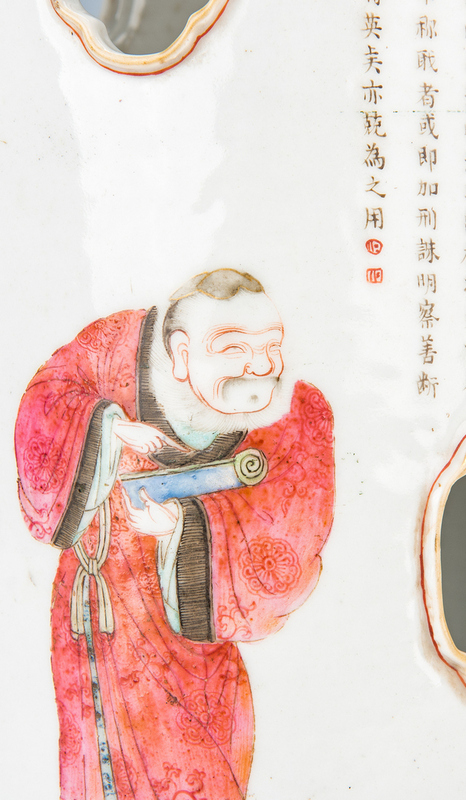 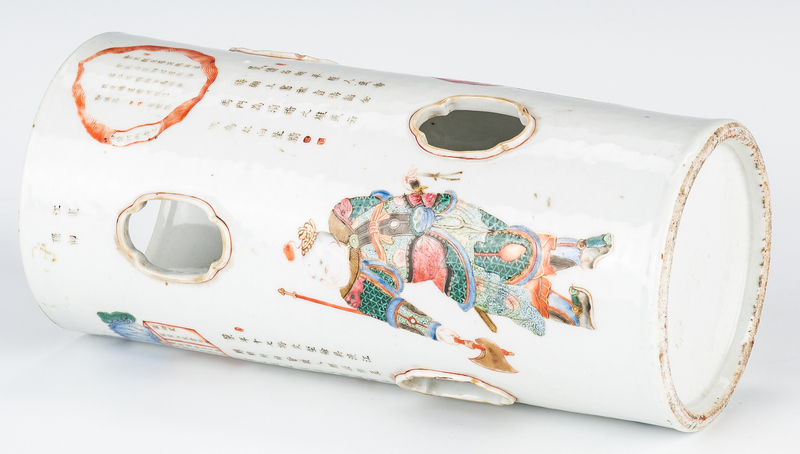 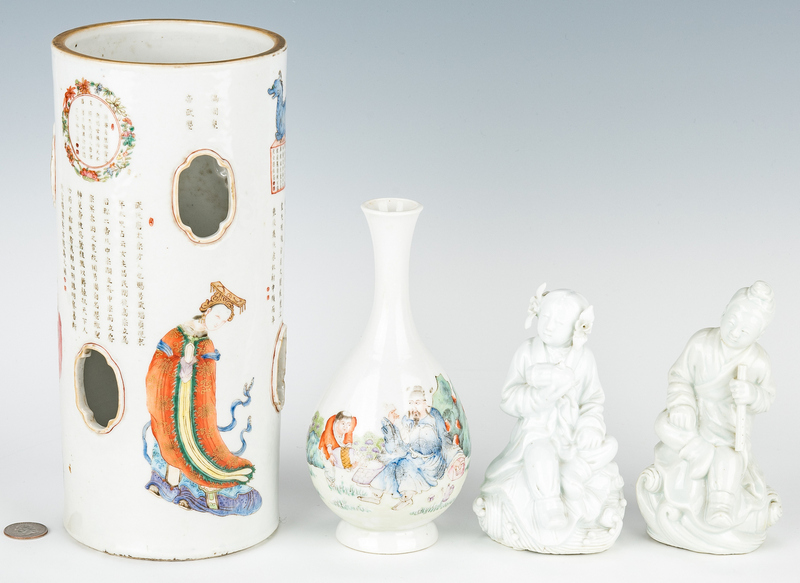 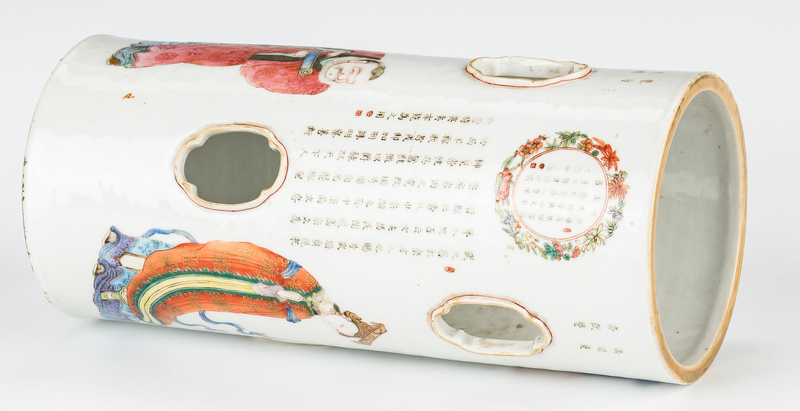 1st item: Chinese Famille Rose porcelain hat stand with multiple poem inscriptions and quatrefoil piercings, additionally decorated with figures and dragon sitting atop a box enclosing calligraphy. 10-3/4" H. Late 19th to early 20th century. 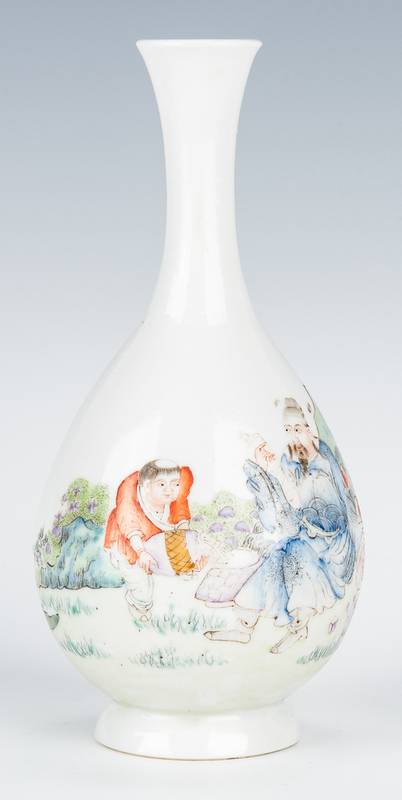 2nd item: Small bulbous porcelain vase decorated with figures of older man and boy, possibly a teacher and protege, in a landscape setting. Seal mark to underside. 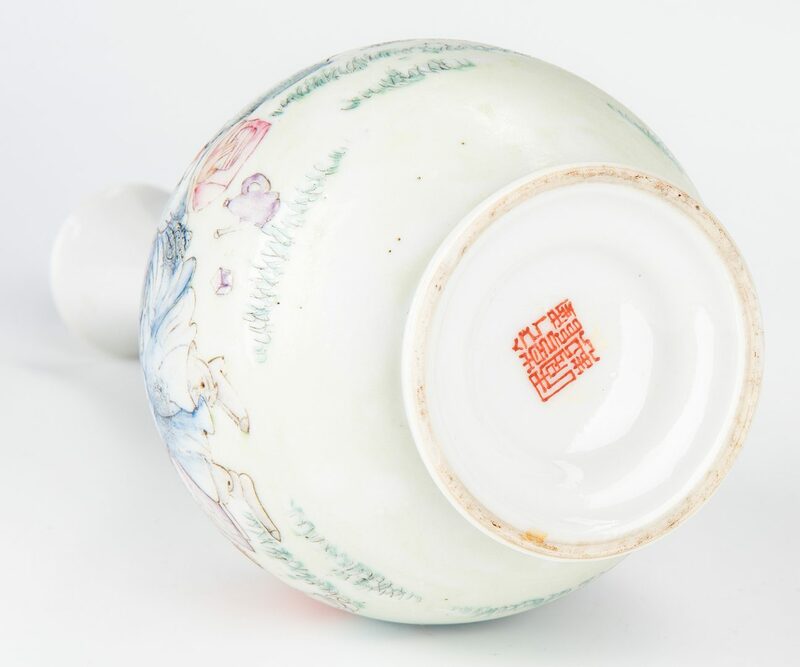 Likely Republic period, early 20th century. 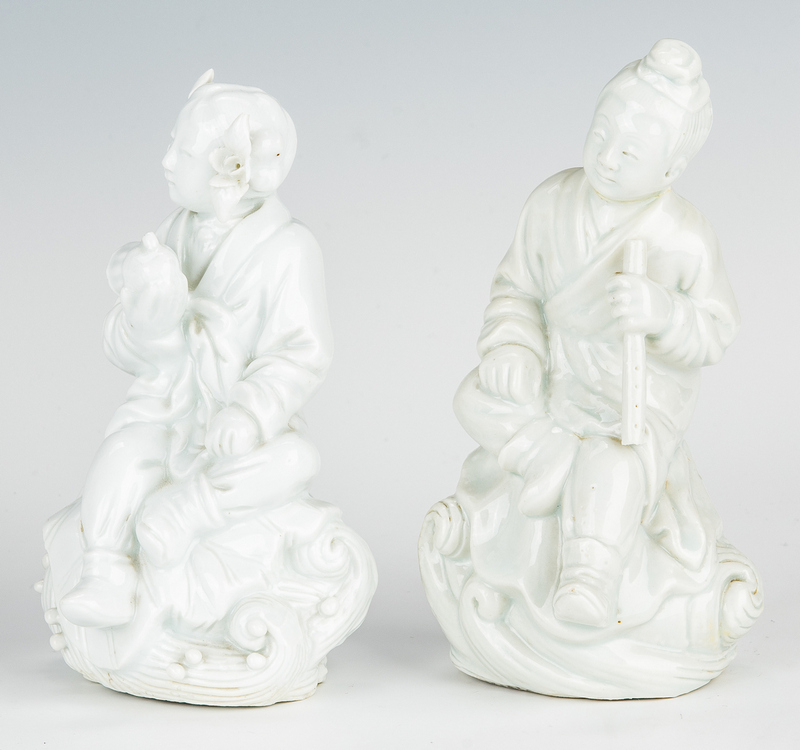 7 3/4"H. 3rd and 4th items: Pair Blanc De Chine porcelain figurines of children, seated atop scrolled bases simulating waves. Male figure holds a wind instrument, while female figure holds a barrel or fruit. 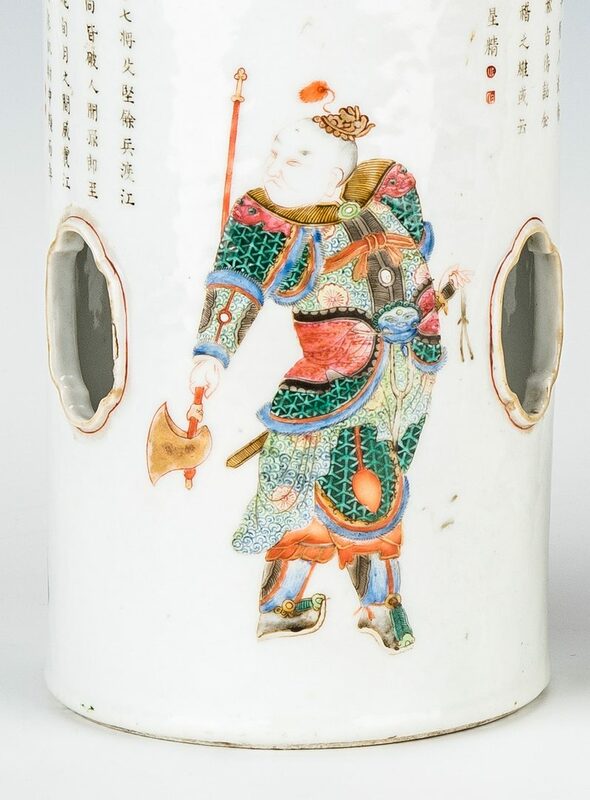 5 3/4"H. Chinese, first half 20th century. 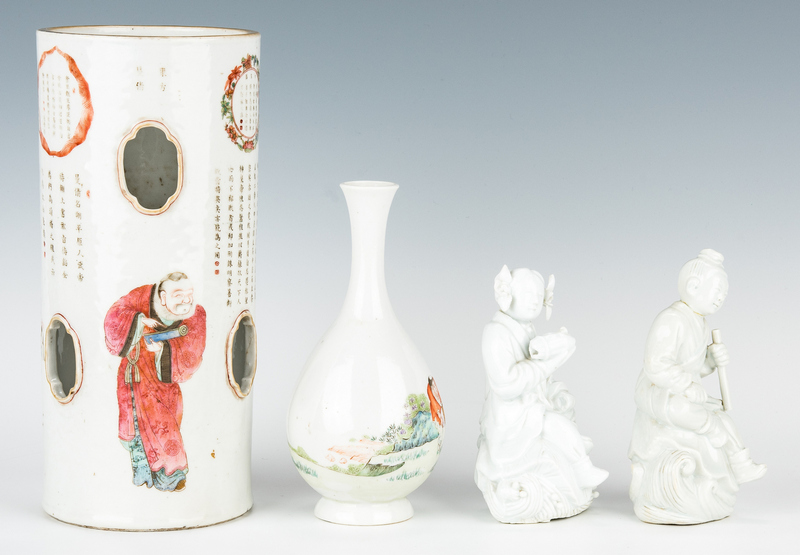 Provenance: Private Tennessee collection. 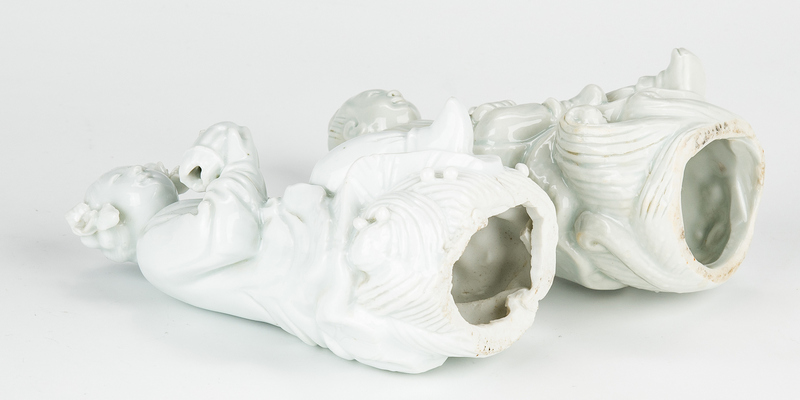 CONDITION: Hat stand: Some light wear to decoration and calligraphy, scattered grime. 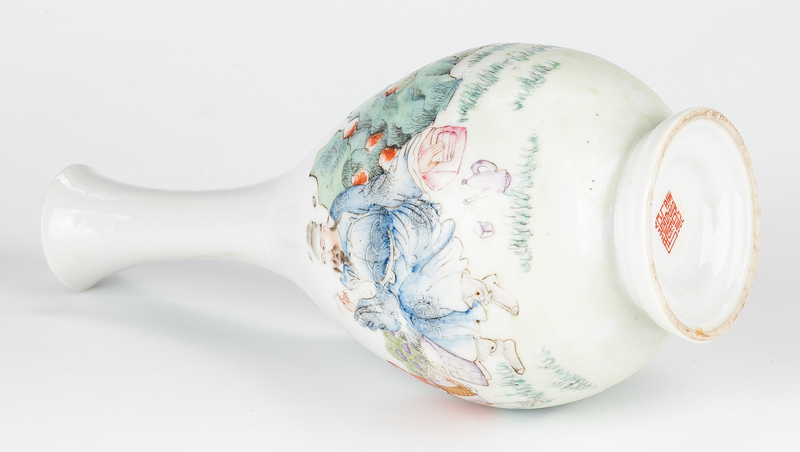 Small Vase: Excellent condition. 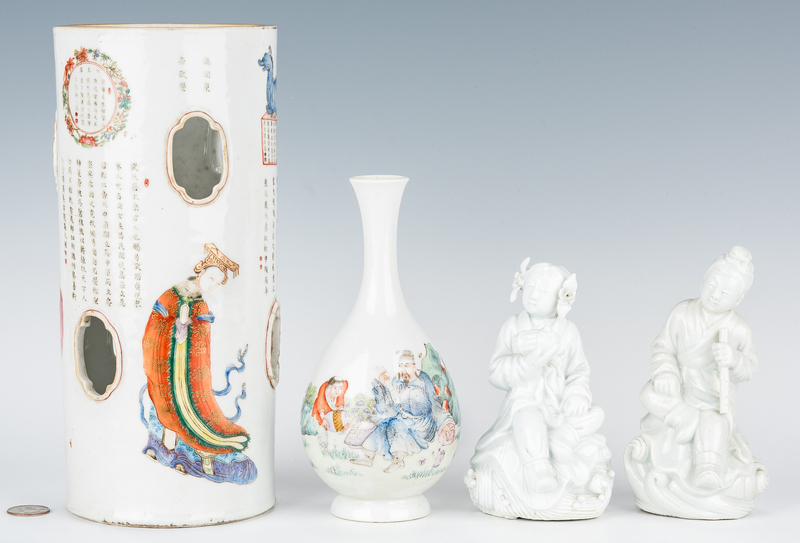 Blanc de chine figures: male figure with repair at neck, female figure with small losses to top of barrel/fruit in her hand and flowers in hair.